So without further ado, here are some of the best and most interesting games of the second generation! Combat was a launch title for the Atari VCS and included 27 variations of Tank (an arcade game from 1974, created by Kee Games. Read more here). Some variations were played with tanks and others with planes. What is weird about Combat, at least from a modern gamer’s perspective, is that two players are required. Nowadays you would be lucky to find a game that allows for two players (at least locally). Having become quite experienced at creating PONG games, Atari created Combat with Pong modes as well. To be honest, these variations were extremely similar to each other and the claim of “27 video games” is misleading. Still, very few games if any at the time included variations of any sort, so this stood out. If you would like to read about the technical aspects of making Combat, take a look at Racing the Beam by Ian Bogost. Combat today doesn’t have a whole lot to offer, being that it was a “foundation,” if you will. Its gameplay is very simplistic and somewhat clunky to control. Still, to the gamer of that era who had never seen anything like this before, it was a welcome change of pace (or it would have been, if not for the video game crash of 1977. D’oh!). Developers were quite enthusiastic about making 3D games at a time when consoles could barely render two dimensions. Cosmic Conflict was a shooter reminiscent of Nintendo’s Star Fox. You fly around space in a fighter and shoot enemies. One cool thing about this game is that the backgrounds can be surprisingly pretty–the planets in particular are very colorful. 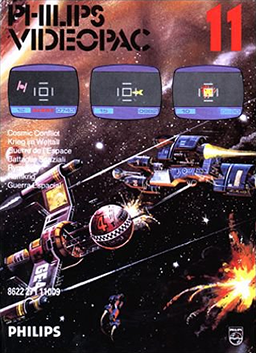 Cosmic Conflict allowed for one or two players and places you in a fighter ship called the Centurion. You take the role of the Centurion’s commander and guard the Earth from an alien invasion (why yes, this game did in fact come out the same year as Space Invaders). There is no ending to the game– you simply strive for a high score based on how many enemies you shoot. Cosmic Combat may have gone on to inspire the Starpath game Phaser Patrol, but considering how obscure it is this is doubtful. Cosmic Combat was fortunate enough to enjoy limited success in Brazil and parts of Europe, but faded out of the spotlight pretty quickly elsewhere. There’s not much more to say, so enjoy a screenshot. 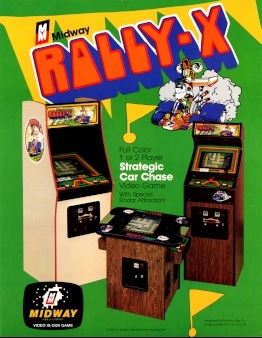 Created by Sega, Frogs was the first electronic arcade game to include a static background, and the first ever game to feature a jumping protagonist. The sprites would be displayed on the static background by being reflected off a mirror at 45 degrees. This meant that the computer had to render the sprites backward so that the player would see them on the background the right way. It appeared that Frogs had really advanced graphics, because the artist could draw an intricately detailed backdrop without worrying about computer resources. In the game you take control of a frog on a lily-pad and must jump up into the air to catch insects that are flying by. Of course, it’s not enough to just touch them; you have to stick your tongue out and catch them on the sticky tip. Frogs served as the basis for Frogs & Flies on the Atari VCS and Frog’s Bog on the Intellivision which both pit two players against each other to see who can eat more bugs. 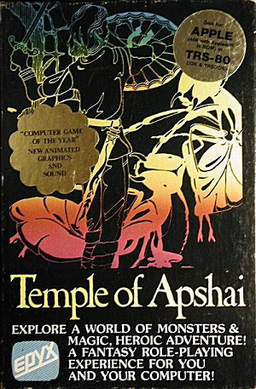 Temple of Apshai is one of the very first graphical CRPGs (Computer Role-Playing Games), predating even Akalabeth by Richard Garriot of Ultima fame. It was developed by Automated Simuations which would later be known as Epyx. Temple of Apshai was the first RPG with room descriptions–a welcome feature, considering that the game contained over 200 rooms in four dungeons to explore. Unfortunately the game itself did not have enough room to store all that text so it just gave a number. The player would then look up the number in the manual and read the corresponding description. There is no ending to Temple of Apshai. The player is simply given better weapons and armor to fight stronger monsters. For the sake of replay value there are four different difficulty levels and two game modes–Innkeeper and Dunjonmaster. When the player loses a battle and faints, he may be rescued by an NPC (non-player character ) who keeps a part of his inventory as payment for the rescue. The game was a phenomenal success, selling 30,000 copies within two years of release (for the PC market, this was huge). The success of Temple of Apshai paved the way for a burgeoning CRPG market. Battlezone wa s a pseudo 3D game made up of vector wireframes. Because the player looks at the screen through a periscope manifold, it is often considered the first Virtual Reality game. In Battlezone the player takes control of a tank and drives around a flat plain firing at enemy tanks. The HUD included a radar showing the positions of enemy tanks. This game was one of the earliest to be subject of wild rumors. One such rumor insisted that you could drive the tank out of the valley, up to the top of the volcano in the background, and visit a castle inside the crater. Like most other arcade hits of the day, Battlezone was eventually ported to console and turned out pretty well (mirror). In the meantime a different arcade version was commissioned by the military as a training tool. 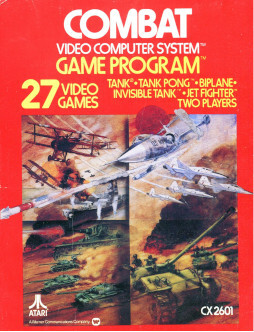 The lead designer Ed Rotberg initially refused to work on it, but finally agreed when Atari promised him they would never ask him to be involved with the military again after the project. Alas, only two of the machines were ever produced. One was delivered to the Army and is presumed lost; the other was found–of all places–by a dumpster near Midway Games’ office. Rally-X is one of those games I really wanted to write an appreciation article on, so much so that I even recorded a video of it and its sequel. Rally-X has it all! For one thing, it was the first game to feature constant background music (whereas Phoenix (mirror) only played a couple short clips and then went silent). The whole game has a fun, cartoony look and feel to it. The car you’re driving is highly maneuverable and comes equipped with a device that emits smoke clouds to throw off your pursuers. It can be extremely satisfying to make three cars on your tail suddenly spin out as you round the corner to nab the final flag in the stage! So what was the problem? Well, the game is nice for the first couple hours, but it gets old fast. A truly great game will be playable forever–I’ll keep playing Team Fortress 2 until they pry the Oculus Rift from my bald, wrinkly head. Rally-X, on the other hand, wears out its welcome. Still, it’s quite a bit of fun and not a bad way to spend an afternoon if you’re pressed for options. Since PONG was Atari’s flagship product, many of their games in the ’70s were variants of the game or expansions on its concept. If you look closely at a screenshot from Breakout! you can see that the bottom half of the screen is just a ball and paddle. Warlords built upon the concept of Breakout! and made it competitive. In this crazy-fast party game, four players defend their kings (the figures in the corner) from each other. The object of the game is to bounce the ball through the other players’ castle walls and strike the king dead, while also deflecting the ball away from your own. Perhaps the best gameplay mechanic is that a defeated player can still move his paddle around and affect the course of the game. Simply genius! 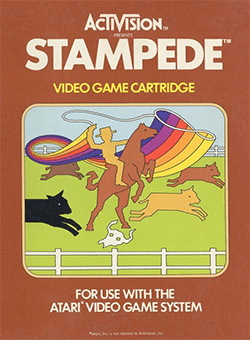 Although the Arcade version came out first in 1980 and the Atari VCS port was released the following year, development of the console version actually started first. The VCS version was written by Carla Meninsky who was one of two female designers at Atari, along with Carol Shaw (who designed River Raid). Carla also worked on the award-winning Dodge ‘Em and an unreleased prototype of Tempest. The idea of a snake game floated around quite a bit in the 70s. The history is way too detailed to go into detail on this page, but you can read about it here. The earliest snake game was most likely Blockade by Sega, released in 1976. It is a two player game where the object is to outlast your opponent; one of you will eventually run into the walls, your tail, or your opponent’s tail. Many variants of snake games were made afterwards, some being single-player and others being two-player. The famous lightcycle game from the movie “Tron” is a variant of Blockade, for example. One lightcycle will eventually be trapped and run into its own trail. The snake game languished in the latter half of the ’80s and remained obscure until being included in Nokia phones beginning in 1998. This Nokia version closely resembles Snake Byte for the Apple //e. Thanks to this the game nowadays is very well-known. 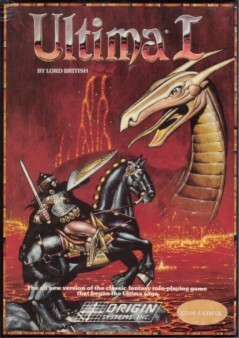 Ultima had the technical advantage of being built off Akalabeth’s engine, enabling Garriot and his partner to create the game in less than a year. The overworld map is top-down perspective with tile-based graphics, but the dungeons are first-person–this style is quite distinctive. Unlike other games of the time, Ultima allows the player to customize his/her own character at the start of the game. Ultima was probably the first game to use more than one side of a floppy disk. The game was a huge success, selling 20,000 copies by 1982 (remember, this sales figure would’ve been considered a failure for a console game but for the PC market it was huge) and went on to sell over 50,000 in the long run. You can buy the original Ultima trilogy, as well as the rest of the series, on GOG.com. Next time we’ll take a look at the games of 1982. That year was so great that it warrants its own article. << Why Games Appreciation? .